Grammy-nominated PETER BOYER has emerged in recent years as one of the most frequently performed American orchestral composers of his generation. His works have received over 300 public performances by more than 100 orchestras, and numerous national broadcasts in the U.S. and abroad. He has conducted recordings of his music with three of the world's finest orchestras, the London Symphony Orchestra, the London Philharmonic Orchestra and the Philharmonia Orchestra. He has received seven national awards for his work, including two BMI Awards for young composers, the First Music Carnegie Hall commission, and the Lancaster Symphony Composer's Award. Conductor Keith Lockhart chose Boyer for the Boston Pops 125th anniversary commission honoring the legacy of John, Robert, and Ted Kennedy. Acclaimed actors Robert De Niro, Morgan Freeman, Ed Harris, and Cherry Jones narrated the premiere of Boyer's The Dream Lives On: A Portrait of the Kennedy Brothers in May 2010, which was attended by members of the Kennedy family, and received extensive national media attention. Boyer's work was the centerpiece of the TV special An American Salute: The Boston Pops at 125, produced and broadcast by WCVB-TV, Boston's ABC affiliate, which won a Boston/New England Emmy Award. The work was also performed at the 37th annual Boston Pops Fireworks Spectacular on the Charles River Esplanade, for an audience of over 750,000, and telecast on WBZ-TV, Boston's CBS affiliate. The Boston Pops also performed Boyer's Kennedy Brothers at the Tanglewood Music Festival with narrator Alec Baldwin, and at Hyannis Port with narrator Chris Cooper, and released a commercial recording of the work on the BSO Classics label. Conductor Miguel Harth-Bedoya appointed Boyer as the 2010-11 Composer-in-Residence of the Fort Worth Symphony Orchestra, and led 10 performances of his works during that season. Gerard Schwarz, Conductor Laureate of the Seattle Symphony, commissioned and premiered Boyer's Festivities to celebrate the 50th anniversary of the Eastern Music Festival in 2011. Boyer's music has been performed by the symphony orchestras of Dallas, Nashville, Pacific, Phoenix, Buffalo, Fort Worth, Brooklyn, Kansas City, Virginia, Hartford, Toledo, Richmond, Grand Rapids, Elgin, Rhode Island, Portland, Winston-Salem, Fresno, Santa Barbara, Sarasota, Kalamazoo, Fort Wayne, Greenville, Bamberg, Belgrade, the New York Youth Symphony, Young Musicians Foundation Debut Orchestra, and many others. The Pasadena Symphony appointed Boyer as its Composer-in-Residence for the 2012-13 season and commissioned his Symphony No. 1; he conducted that orchestra for its premiere. Boyer's symphony is the centerpiece of his latest recording, made at Abbey Road Studios with the London Philharmonic, to be released by Naxos in early 2014. Boyer's major work Ellis Island: The Dream of America for actors and orchestra, which celebrates the historic American immigrant experience, has been his most successful composition to date. Premiered in 2002, the work has received over 140 live performances by more than 60 orchestras, making it one of the most-performed American orchestral works of the last decade. Boyer's recording of this work was released by Naxos in its American Classics Series in 2005, and was nominated for a Grammy Award for Best Classical Contemporary Composition. The League of American Orchestras' Symphony magazine recently profiled Ellis Island as one of "a handful of recent works by living composers becoming orchestral standards." In addition to his work for the concert hall, Boyer is active in the film and television music industry. In recent years, his skills as an orchestrator (one who works from composers' sketches to create complete orchestral scores for recording) have been increasingly in demand. Boyer has contributed orchestrations to more than 20 Hollywood film scores, from studios including Warner Bros., 20th Century Fox, Paramount Pictures, Disney, Pixar, Universal Pictures, Sony/Columbia Pictures, Touchstone Pictures, Lionsgate/Marvel, Intrepid Pictures, and Relativity Media. Boyer has orchestrated music for several of Hollywood's top composers, including James Horner (The Amazing Spider-Man), Thomas Newman (the James Bond film Skyfall), Alan Menken, Michael Giacchino (the Oscar-winning Up, Star Trek, Cars 2, Super 8, John Carter, Mission: Impossible III, Speed Racer), Mark Isham (Dolphin Tale, The Conspirator), Harry Gregson-Williams (Arthur Christmas) and the late Michael Kamen (Open Range, First Daughter, Against the Ropes). Boyer orchestrated suites from the scores to Toy Story 3 by Randy Newman and Wall-E by Thomas Newman for Pixar in Concert, a live event produced by Disney/Pixar, performed by the San Francisco Symphony and Hollywood Bowl Orchestra, and now being performed worldwide. For television, Boyer has twice arranged and orchestrated music for the Academy Awards, including the 2009 telecast, and orchestrated several of Mark Isham's scores for the ABC series Once Upon A Time. Boyer composed original scores for episodes of The History Channel series Engineering an Empire. His music has also appeared in documentary film, short films, and a variety of television programs. Boyer's work has been profiled and reviewed in such media outlets as the Associated Press, USA TODAY, Variety, CNN.com, New York Times, Los Angeles Times, Boston Globe, Dallas Morning News, Hartford Courant, Symphony Magazine, BBC Music Magazine, Gramophone, and many others. 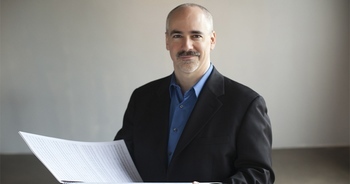 Boyer has carried out composer residency work in conjunction with performances of his music around the United States, including at Brown University and Vanderbilt University, and with Orange County's Pacific Symphony. As conductor, Boyer has led such orchestras as the Brooklyn Philharmonic, Hartford Symphony, Rhode Island Philharmonic, Richmond Symphony and Pasadena Symphony, and has conducted recording sessions from London's famed Abbey Road and Air Studios to the scoring stages of Los Angeles. Boyer was born in Providence, Rhode Island in 1970, and began composing at the age of 15. His first major composition was a large-scale Requiem Mass in memory of his grandmother, composed while only a teenager. He was named to the first All-USA College Academic Team, comprised of "the 20 best and brightest college students in the nation," by USA TODAY in 1990. Boyer received his Bachelor's degree from Rhode Island College, which awarded him an honorary Doctor of Music degree in 2004. He received Master of Music and Doctor of Musical Arts degrees from The Hartt School of the University of Hartford, which named him its 2002 Alumnus of the Year. There his teachers included Larry Alan Smith and Harold Farberman. Following his doctoral work, Boyer studied privately with John Corigliano in New York, then moved to Los Angeles to study film and TV scoring at the USC School of Music, where his teachers included the late Elmer Bernstein. In 1996, Boyer was appointed to the faculty at Claremont Graduate University, where he holds the Helen M. Smith Chair in Music and the rank of Full Professor. In 2003, Boyer launched Propulsive Music, a publishing company representing his music. He resides in Altadena, in the San Gabriel Foothills just north of Los Angeles.